A few weeks ago, the girls and I attended a cooking class at Oilerie, a local olive oil and vinegar store. 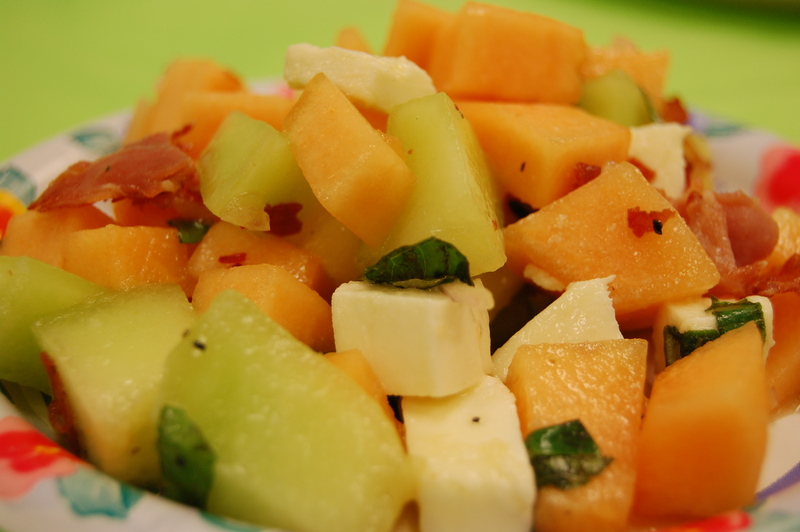 We made a couple wonderful summer salads and I just had to share the recipe for the Melon and Mozzarella Salad. I usually am not a big fan of melon, but this salad has had me craving it since the first bite. The prosciutto is a surprising, salty addition that adds an extra special kick. Cook the prosciutto in 2 Tbsp olive oil in a skillet until crisp. Place on a paper towel lined plate and set aside. Next, combine the melon, mozzarella, basil and mint in a large bowl. Whisk together lime juice, 4 Tbsp oil, shallot, honey, salt and pepper. Drizzle over fruit and toss to coat. Garnish with prosciutto. This is the perfect salad for a hot summer day. My mouth is watering! I’ve saved this in my “salad” file and as soon as we get a hot (or slightly) warm day I’ll try it! oh yum!! i love summery recipes like this one. beautiful blog!! I was at the class too and can attest that it was simply fabulous! I made the salad for my Mom for Mother’s Day. The basil, mint and prosciutto definitely give it more savory taste, but the lime and melon let the brightness shine through. Mmm these articles have my mouth watering already! My fiance’ and I are planing our destination weddings in the caribbean and are still looking for all the foods we want. We have pretty much got a good idea now! Thanks for all your tips and recipes!